1-2 drops dissolved in water or other liquid 1-3 times per day. High doses of Pau D'Arco extracts promote prolongation of prothrombin time (reduction of blood clotting), so people suffering from blood clotting disorders should not use the supplement without consulting a specialist. 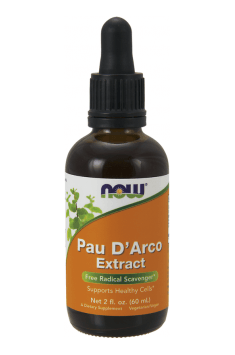 Some studies suggest that Pau D'Arco may temporarily impair fertility in both sexes, which is why I suggest that people who try to conceive should not take this supplement. In return, I suggest similarly acting extracts from an olive leaf or an oil of oregano.